Curzon Home Cinema's on demand film service now available on Freesat | What Hi-Fi? A new on demand film service created by one of the UK's leading independent cinema groups has now gone live on Freetime, the connected TV service from Freesat. 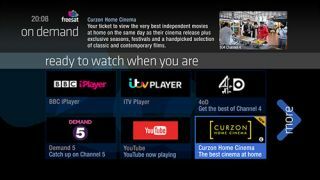 Curzon Home Cinema has become the first film on demand and pay-per-view player to launch on Freesat's Freetime service, joining the likes of iPlayer, 4oD and more. The new service will give Freetime viewers a chance to view the latest releases at home – with some titles even available from the day they open at your local cinema. And you won't need to pay a monthly subscription fee to make use of the new service, with films streamed from just £1. Curzon says you'll only pay for what you watch. Freesat managing director Emma Scott said: "We are excited to launch our first film on demand player, which enables Freesat viewers to watch some of the best independent films available." Curzon Home Cinema director Phil Mordecai added: "We are proud to offer Freetime viewers this unmatched cinema at home experience utilising the very best on demand technologies." The Curzon Home Cinema Player is now available on all Humax Freetime set top boxes, while it's due to launch on Panasonic Freetime smart TVs this month [June].